Brief Description: SolarPanels.cheap operates a UK-wide solar panel recycling and reuse scheme. Find out more about Solar Panel Recycling. Products and Services Available: Recent studies have shown that solar panels lose less than 0.5% of their efficiency each year, which means that a 30 year old solar panel will produce in excess of 85% its peak electricity output. Even after 100 years, a solar panel will still be producing an impressive 50% or more of its original electricity, which is a lot of free, green and renewable electricity. Due to the long life of solar panels, SolarPanels.cheap has created a UK based reuse scheme, which aims to ensure that usable solar panels continue to generate electricity, rather than end up in our already overflowing landfills, where they can have negative effects on the environment due to their toxic contents. Solar Panel Recycling and Reuse - if you have solar panels that you no longer want or need, rather than making the trip to the tip where they will clog our landfills, why not list your solar panels, and get someone else to come and collect them. It is free for everyone, and you will give your panels an extra life, where they can continue to generate free solar panels for many years to come! 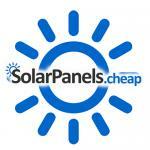 Free Solar Panels - If you want free solar panels, SolarPanels.cheap is the place for you. You can find a number of different types of free solar panels, from installers who will put the panels on your house for free to owners of old panels who no longer need them, so want to give them a new life generating electricity for someone else.